Being able to return to the Ottawa River brought back some great memories for me. In 1999, I was part of a team contracted to develop several marketing tools for what was then known as the Temiskawa Waterway or Lake Temiskaming and Ottawa River Waterway. When the waterway was in operation, lift stations equipped with hydraulic marine trailers transported boats around the various hydro dams and rapids on the river allowing boats to cruise a distance of 468 kilometres. 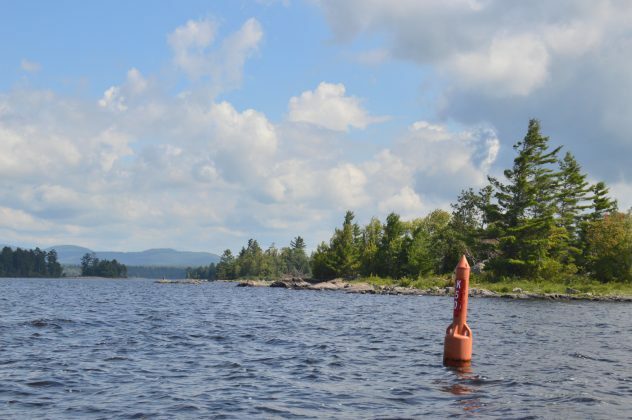 While the lift stations are no longer operating, the Ottawa River still provides a boating destination for the adventurous that few places in the world can match. If you can trailer your boat to the Ottawa Valley, you can explore several sections of the Ottawa River for a day, a week, or more, along its scenic waters. Close to shore, pitch a tent and build a fire, dock at a marina, head to a hotel or spend your nights at anchor — it is all possible. You can access the Ottawa River via several communities, and for this trip, we elected to make Pembroke our home base for our brief time on the river. 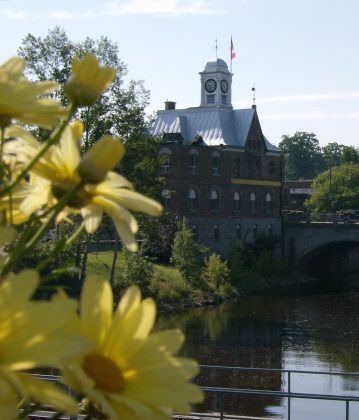 Pembroke is the largest community on the upper Ottawa River, offering numerous goods and services for boaters. In town, there are several choices of hotels and multiple restaurants that will take care of your land based needs. 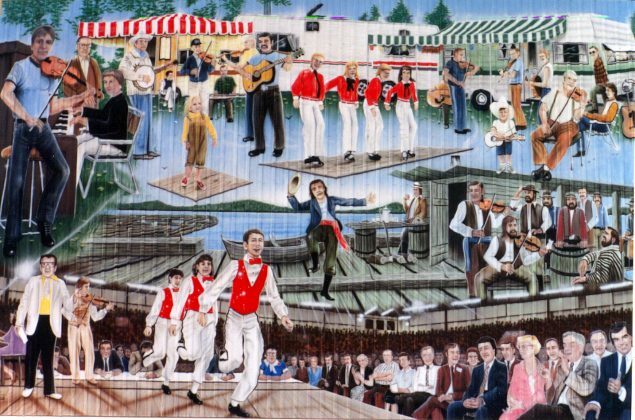 Set aside some time to explore, take in the historic walking tour and enjoy the heritage murals. 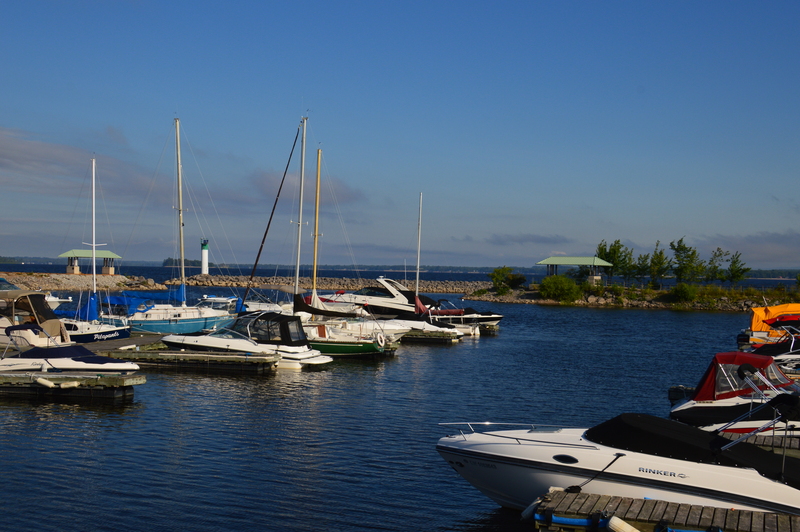 Protected by a stone breakwater, the marina has ample docks, a launch ramp, washrooms and showers. It’s located just steps from the bustling downtown so all of amenities are just a stroll away. 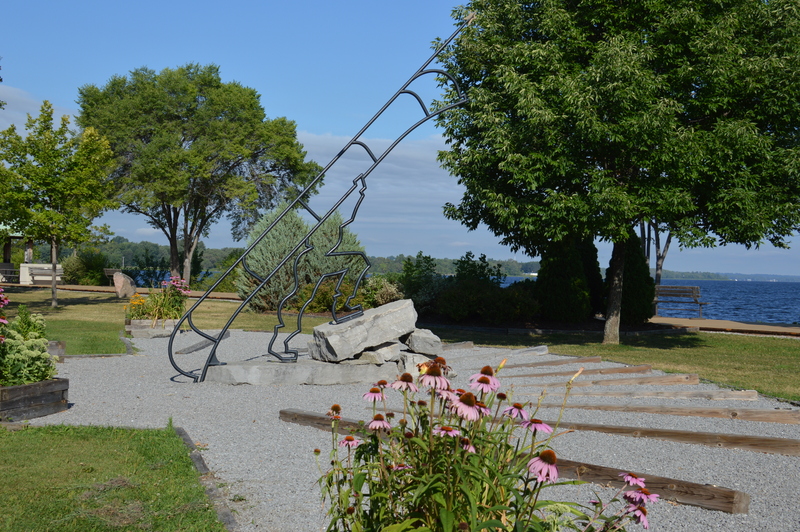 Pembroke also has an excellent waterfront park, Riverside Park, where you can walk or bike to the beach, bandshell, amphitheatre or campgrounds. Having arrived in Pembroke the previous day, we were set for an early start. Regardless of the hour, Jordan Durocher from the City of Pembroke joined us at the marina to fill us in on the city and its sights and services. Afterwards, my wife, Lisa, and Melissa Marquardt from the Ottawa Valley Tourism Association helped launch the Princecraft for our first day on the river. Overhead sunshine and light cloud cover promised us a pleasant day on the water. Prepared with both charts and the route plotted on my iPad, we would be cruising approximately 65 km up river and back by the end of the day. This section of the river is relatively wide with open stretches of water that are easily navigated. It looks and feels more like a lake than a river. Between Pembroke and our destination of Rapides-des-Joachims, the river is dotted with beaches and campsites that are free to boaters. Just above Pembroke the small craft route allows you to pass Cushing Island on either side, aided by markers. Looking up river it was easy to spot one of the old lighthouses that once guided commercial traffic on the river. Now they are preserved for the enjoyment of recreational boaters. As we proceeded upriver toward Petawawa we entered one of the more challenging sections of the river, but also one of the prettier areas as well. Numerous islands and rock shoals inhabit these waters, but the route through is well marked. This rocky section reminded me more of Georgian Bay than the Ottawa Valley. 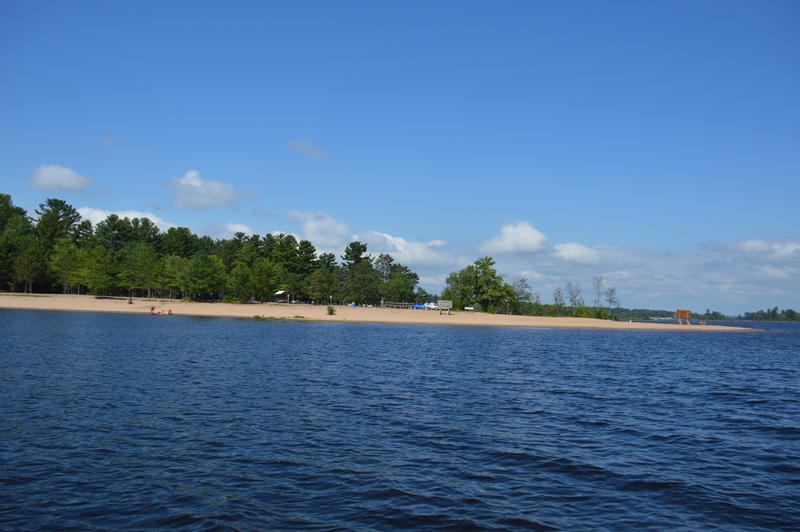 While fishermen enjoy the shoals and islands, local boaters are drawn to this area for its numerous beaches, like Petawawa Beach. After passing the Petawawa River, we caught sight of Jubilee Lodge Marina on the edge of Petawawa. The marina is located on Canadian Forces Base Petawawa, but it welcomes boaters from the public and offers a wide range of services. The marina has transient docks, fuel, service, a ramp, camping and golf. Town is just a short taxi ride away. Petawawa was settled in the late 1800s, when logging was the main industry that helped open up the Ottawa Valley. With a population of just over 16,000 the city is the commerce and services centre for this part of the Valley. Boaters can find accommodation options, restaurants galore for dining ashore and a wide range of services for a community of this size. If time allows, a walk through the historic downtown is in order to take in the fantastic architecture from the late 1800s and early 1900s. You may also wish to visit the CFB Petawawa Military Museum for history of the base that has been around since 1905. After we made a quick visit there, we headed back onto the water for Deep River. Passing through the narrows before the light at Short Turn I could really feel the powerful current of the Ottawa River. 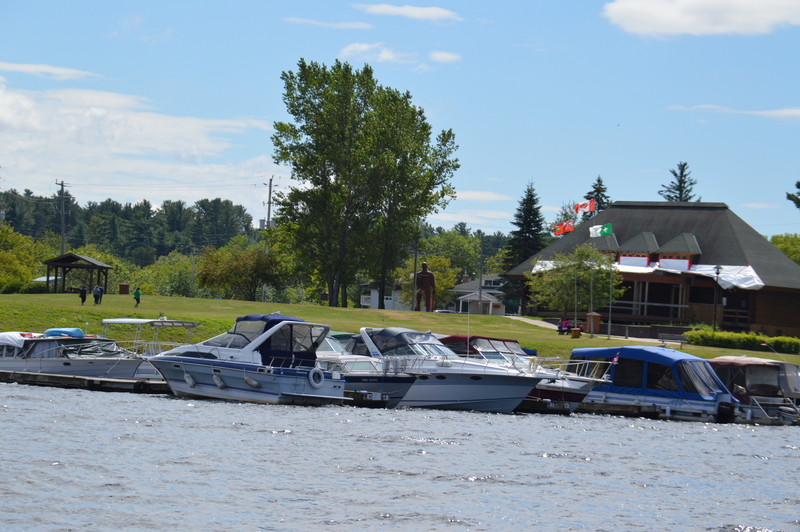 Across the river and upstream from Petawawa is a very popular boating destination, Fort William. While it was quiet on a weekday, the waters, beach, volleyball courts and pub are packed with boaters every weekend. Something to keep in mind when beaching a boat on the river — keep an eye on it. The hydro dams control water depths in the river. If power demands change the river level can go up or down suddenly causing your boat to drift off the shore or leaving your boat high and dry. For several miles, there are wonderful stretches of beach on both sides of the river. Unfortunately, quite a length of shoreline is off limits as it is part of the Canadian Forces Base. Markers and signs clearly indicate the forbidden areas. A grand old lighthouse on Deep River Islet marks a wide sweeping turn in the river. After clearing the light, check your charts for the location of Oiseau Point. Oiseau Rock is considered a sacred site by the First Nations. If you’re patient you may be able to see some of the pictographs across its face. It is truly worth the stop to have a swim and hike up to the top of the rock for a spectacular view of the river. After a brief visit, we headed back on the river to make a fast run to a prearranged rendezvous in Deep River. 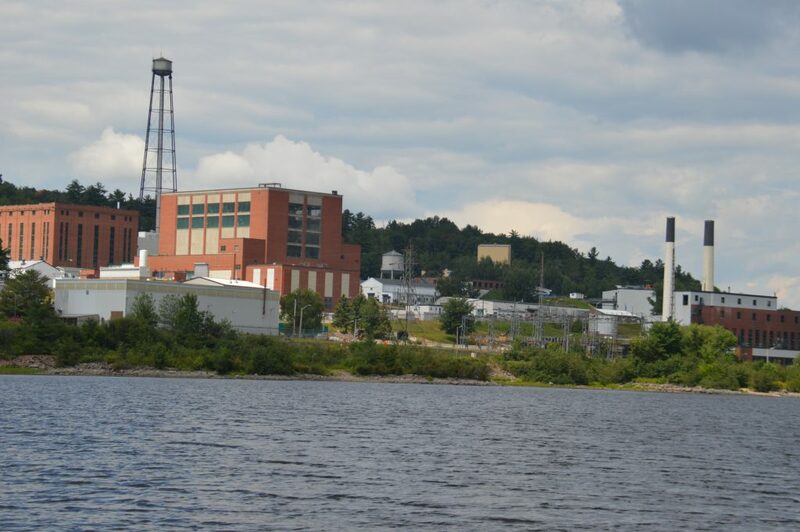 We quickly came upon the Chalk River Laboratory. Opened in 1944, the lab conducts research for peaceful uses of nuclear technology. This facility created the CANDU reactors and is a major supplier of medical isotopes. One glance at the depth metre explains how the town got its name. Off of Pembroke, the river’s depth is 40 feet — here it plunges to 100. After a fast 10 km run, we ducked into the entrance in the breakwall at Deep River Marina, ready for a rest. As we pulled in for fuel, Jason McAuley, a local town councillor and employee at Chalk River was waiting for us. As a boater who makes this his homeport, he was pleased to highlight the marina’s amenities and services. It is a well-protected marina with fuel, pump out, washrooms and showers that is conveniently connected to the town by a walking trail. As we followed along the trail Jason went on to explain the uniqueness of Deep River. It was built as a planned community for the employees of the Chalk River plant. That’s why all of the services are found around the town square and recreation facilities are all within walking distance. The original town square and residential streets and houses look untouched and newer developments are found closer to Highway 17. After a relaxing lunch, hosted by Mayor Joan Lougheed, we expressed our thanks and Lisa, Melissa, cameraman Don Coulombe and I departed the marina hoping to arrive at our final destination 25 km upriver before the darkening skies caught up with us. Here, the Ottawa River flows through wilderness all the way to Lake Temiskaming. It’s scenic, quiet, sparsely populated and popular for fishing. As we cleared the outlet from the dam we could see the docks on the island of Rapides-des-Joachims. Once the site of a Hudson’s Bay Trading Post, “The Swisha,” (the Rapids) as the locals call the area, is home to a small village on the island. There is still a general store that we popped into to escape the rain. We had a snack and a drink and geared up for a wet ride down river to Pembroke. Some days you win while boating, other days you get wet! Eventually the rain did stop and we were able to finish the last leg of the day’s trip in reasonable comfort. Day two of our adventure began with a road trip. We trailered to our chosen launching point just above Deux Rivieres to Antler’s Kingfisher Lodge, a popular family and fisherman’s resort. From our launching point to Mattawa, the trip up river covers 37 km, an easy distance for a round trip outing. While the morning started off cool, higher temperatures and sunny skies were forecasted for the balance of the day. Our run on the river would take us through some of the most remote, but scenic sections of the upper Ottawa River. To stop for a picnic or an overnight on the water, look closely at your charts and explore along the shore slowly to find one of the stream inlets or other little bays to tuck into. After travelling for several kilometres, we came across one of the few navigational aids on this part of the river. 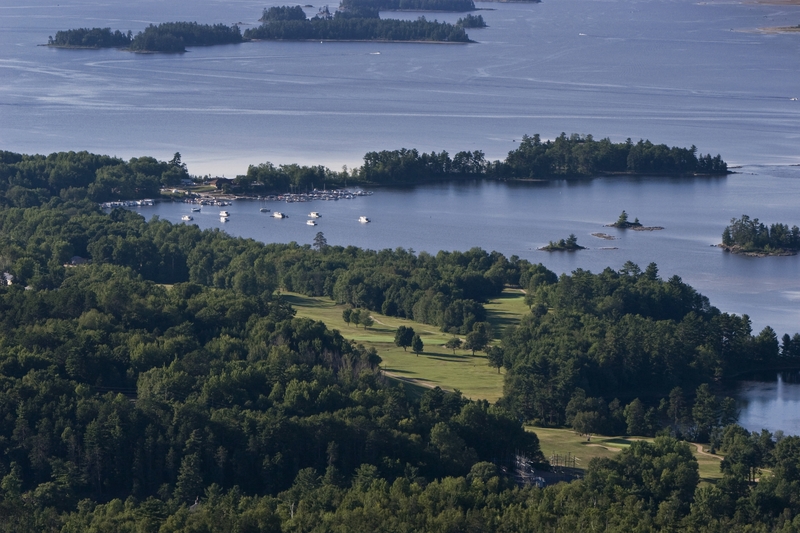 While most of the run is in deep waters, the rock islands and shoals at Bald Rock are clearly marked. In this section, the river is narrower and the shorelines are steeper. While the land adjacent to the river has been extensively logged, and the forests are second growth, it’s not hard to imagine that this is the wilderness that was opened up by Samuel de Champlain 400 years ago. As the skies continued to clear, Melissa commented that it was turning into a fantastic day on the river and Lisa and I couldn’t have agreed more. 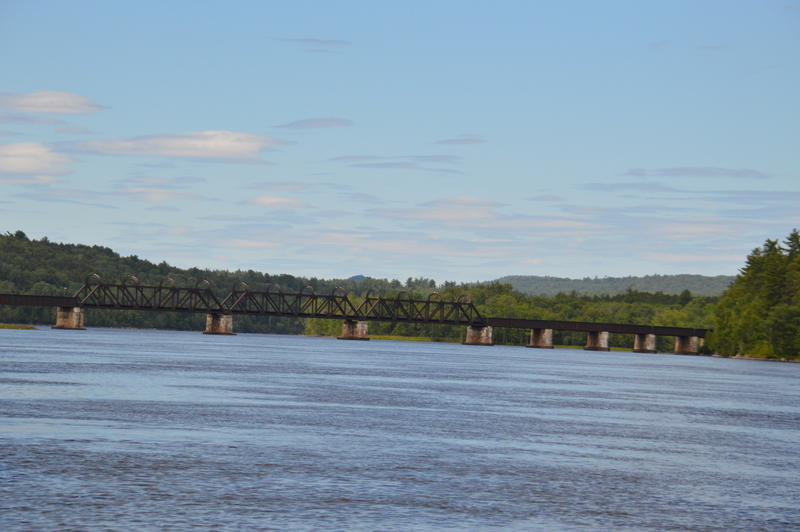 Before long, the railway bridge over the river announced that Mattawa was close by. On the shore, the town began to appear well south of the marina. Markers directed us to the east side of the river to pass under the bridge. Although the marina was close at hand, we decided to run up river to the Otto Holden dam. As you near the dam, you will pass an abandoned concrete launching ramp. It is where a trailer service used to move boats around the dam as part of the organized Lake Temiskaming Ottawa River Waterway. 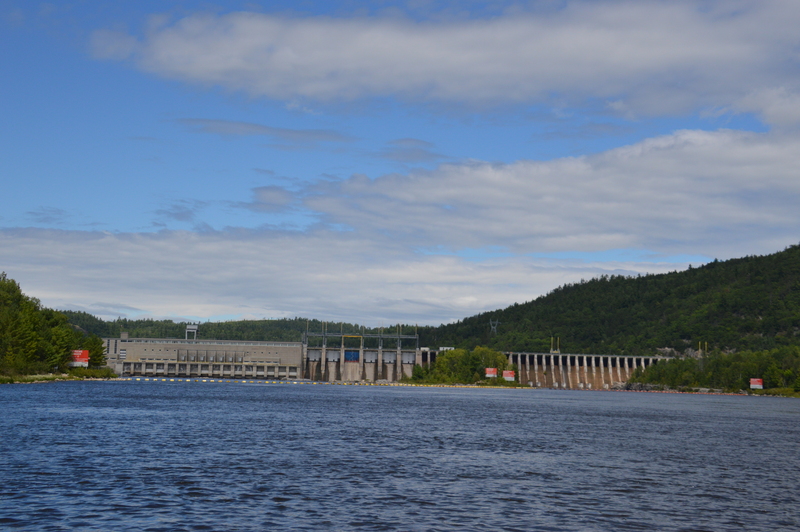 The dam is impressive as it towers over the river from Ontario to Quebec. Construction started on the dam in 1948 and electricity began to flow in 1952. Having checked out the dam, we quickly ran back to tie up at the Mattawa Waterfront Marina. As we pulled into the marina, Jeff McGirr was waiting to introduce us to the Town of Mattawa. After spending the past few hours sitting, we all enjoyed the break and the walk around the town. It is situated in the upper Laurentians, at the juncture of the Ottawa and Mattawa Rivers. 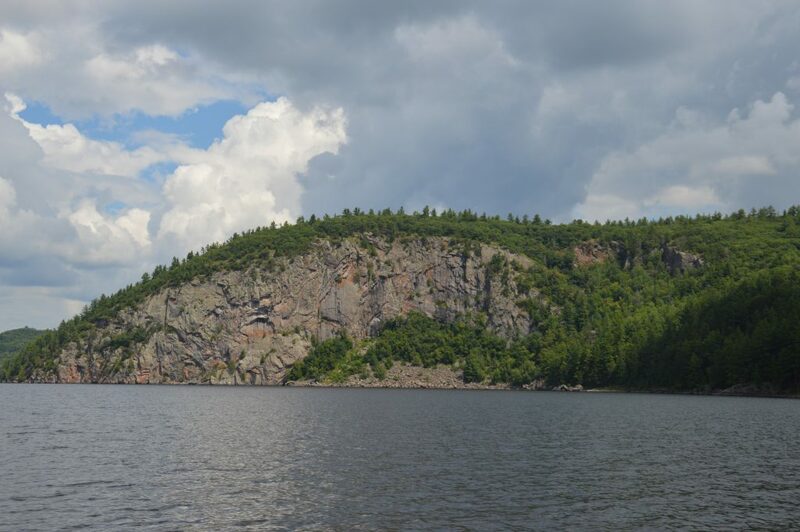 Samuel de Champlain passed through here heading west on the Mattawa River. 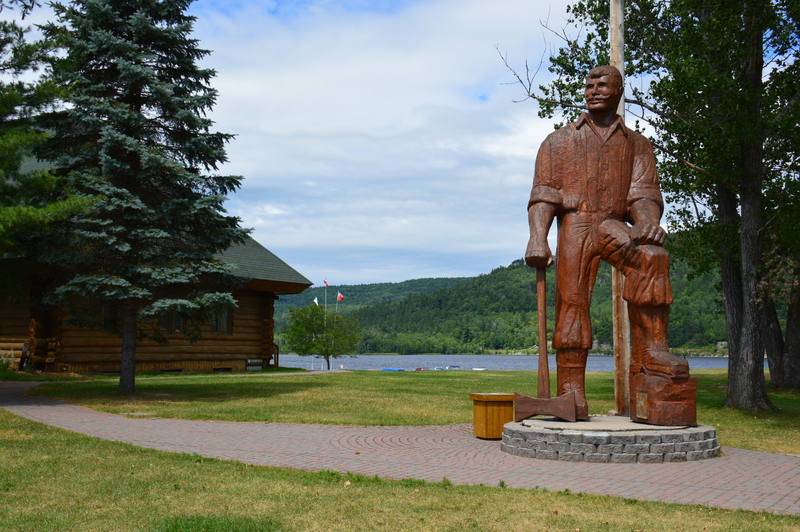 Mattawa has been a stopping place for voyageurs, lumbermen and modern day travellers who come to enjoy the scenic upper reaches of the Ottawa River. The town is friendly and both English and French are spoken here. You will find accommodations, camping, restaurants and shops to take care of your needs. As evening falls you can enjoy the view of the Laurentian foothills across the river, painted by the setting sun. While we only allotted two days for boating on the Ottawa River, one can certainly spend many more days exploring other sections of the river. 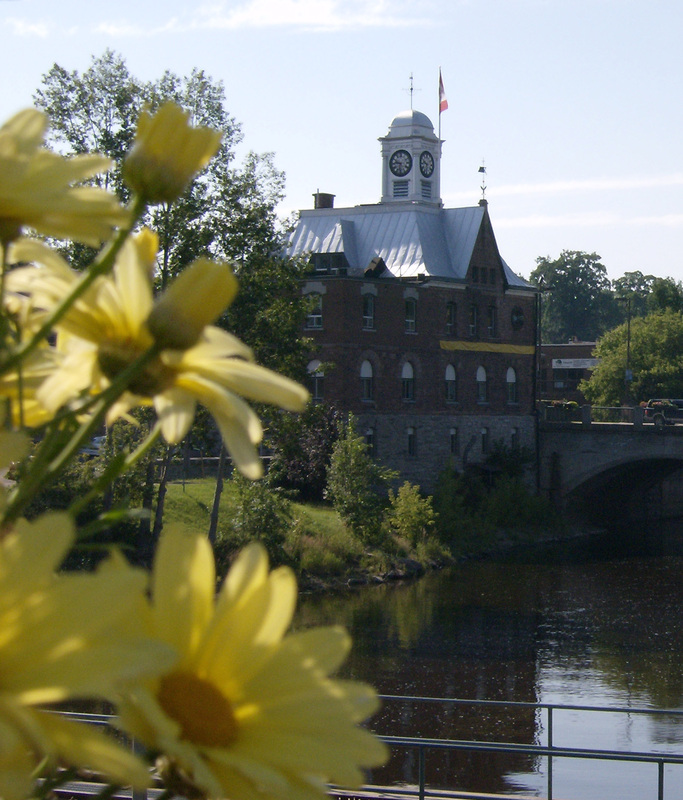 There is a wealth of things to do in the Ottawa Valley, so with boat in tow, take the time to explore this historic waterway and the communities large and small found on its shores. There are numerous of places to launch your boat and, with a little planning, this will be a trailer boater’s trip of a lifetime.